Our vacation home consists of two full units which rent out SEPERATELY. Upstairs is a spacious three bedroom/two bath house which sleeps 8. Downstairs is a two bedroom/two bath house (plus a computer room converted to sleeping area) which sleeps 6. The entrances and parking are separate which ensure privacy. Our home is a hidden paradise on a mountain top. Find peace and tranquility. Go to sleep with the singing of the famous Puerto Rican 'coqui.' Enjoy a spectacular ocean view, custom swimming pool and large yard. This mountain top retreat is private, peaceful, hidden yet only 2 miles from the freeway, largest marina in PR, stores, restaurants and beaches. You can awe at the neighboring islands you'll want to visit (Culebra, Icacos, Palominos, Isleta Marina, and St. Thomas). Upstairs is a colorful traditional Mexican style home with high ceilings, hand painted Mexican tiles and rustic furniture. Delight in solid wood furniture throughout the house. Enjoy a 40 foot balcony with a breath taking ocean view. If you enjoy cooking you won't want to leave this spacious kitchen with mahogany cabinets and stainless steel appliances. Last but not least, you'll fight with the others over the guest bedroom with an amazing underwater mural which covers the entire wall and ceiling! The house downstairs is a modern 2 bed/2 bath plus a computer room converted into an additional sleeping area (rents seperately from this unit). There is a full kitchen, dining area, living room and laundry room. The bedrooms are 12 foot x12 foot with full length closets and mirror doors. 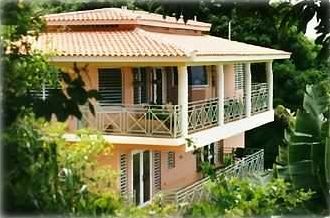 This Non-Smoking house is one mile from Puerto Del Rey marina, ten minutes from Seven Seas Beach, ferries to Culebra and Vieques and the Fajardo Airport. Luquillo Beach and El Yunque Rainforest are 20 minutes away. There are daily flights from Fajardo to Culebra, Vieques and St. Thomas, US Virgin Islands. The Westin Rio Mar and Wyndham El Conquistador Resorts are close by. They offer nightlife entertainment (casinos, restaurants, floor shows, and a championship 18-hole golf course). It sits on an acre lot with 6000 sq. ft. grass lawn, palm, banana and mango trees, orchids... The neighbors are sparse so you rarely hear a car go by. This can all be yours at an affordable price. You will not find another bargain like it in Puerto Rico! My name is Monica and I'm a California native. I am a second grade teacher on an army base. I am a GRCA hobby breeder (golden retrievers). Forced to relocate to San Juan, I decided to rent out my dream home! Recently I survived Hurrican Maria and breast cancer. Praise God. My husband Milito and I maintain the property ourselves. We are a true Vacation Rental by OWNERS. No rental managers! Please come visit us and see if this home passes your expectations! I came to PR 25 years ago as a DOD elementary school teacher. I worked at Roosevelt Roads Naval station which closed due to politcal controversy. Relocated to San Juan area, I converted my brand new dream home into a vacation rental. I hope others love and enjoy the time that I am unable to spend there. This home offers peace, tranquility, harmony with nature and spectaular ocean views. We are located on a mountain top which provides spectacular ocean and mountain views. It's a true hidden paradise. We are 2 miles from the largest marina in Puerto Rico. Public beaches are 10 minutes away. Our mountain top house provides renters with extensive ocean and mountain views. Peace, tranquility, nature, luxury and 2 miles from the freeway entrance. A/C in bedrooms only. We have high ceilings and wonderful breezes. Small interior table with 4 chairs. Larger table on balcony seats 6. Wonderful ocean and mountain views from dinning table. Huge fenced in yard. Wonderful for children. Has table and chairs to eat, relax and enjoy the views. Large terrace with bar-b-que, table and furniture. Large space to accommodate several people at once. Terrace is next to the swimming pool. It's a wonderful common area with spectacular ocean view. Pool is shared with the renters in the downstairs unit. Hot tub is NOT for renters use. Pool waterfall is set on a timer and only turns on 3 hours per day. No Smoking except on balcony or in the yard. Close to all attractions, tours, freeway, stores. It was great to meet all of you! From the beginning when Sal first contacted me, I could feel what a calm, kind, patient person he was. His friendly demeanor made communication between us excellent. His family and friends were very patient when they arrived and the handyman, pool cleaner and ADT technician were still there. We have to get work done in between renters which is hard to do. I enjoyed giving them advice about how to get around, what to expect and to recommend my favorite spots. We hope to see you in the future. Thanks! This home was perfect for our family of 5, well equipped and very comfortable. Location was perfect for the activities we wanted to do on our vacation, far enough away from the crowds but close enough for shopping, dining etc. The property and grounds were magnificent, the views from the deck were great! The property is perfect for a relaxing vacation. The accomodations were clean and comfortable, everything you needed was there. The owners take pride in their home and it shows in every detail of the property. Gorgeous view and great retreat! Thank you Monica for sharing your home. It was beautiful. The view was amazing and very serene. My family enjoyed our stay and wished we could of stayed longer. The accommodations were great and your pets were very friendly! We would definitely come back. The best Place ever! Amazing view! The house is very beautiful, the 3 rooms and beds are very comfortable and the mural of the walls are awesome. The view of the house is also spectacular. The pool is very nice, too. If you are looking for a vacation outside the city but near it, this is the perfect place. The owner Monica is very accessible and Aida the housekeeper is also very kind and available. Also, the owner is a pet lover and she has two cats around the property all the time, so you better be a pet lover, too. Thank you Monica for such amazing house. We are located on a mountain top which makes you feel far away from it all, yet only 2 miles to the freeway entrance, largest marina in PR, grocery, fast foods, bakery and Walgreens. Our location provides extensive ocean and mountain views. Must-do activities, Hiking in El Yunque Rainforest & Las Tinajas river and water hole, trip to Culebra, Vieques and Icacos islands, Fajardo Lights House tour and night Kyaking on the bioluminescent bay. Don't miss Cueva Ventana, Cueva del Indio and Camuy caves.